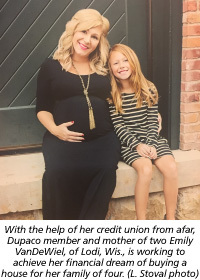 Dupaco Community Credit Union doesn’t miss an opportunity to help its members connect to opportunity. Long-distance member Emily VanDeWiel, of Lodi, is proof positive. Dupaco’s Lisa Mescher reached out to VanDeWiel to discuss the possibility of moving a dealer-financed auto loan to the credit union. VanDeWiel declined, but their phone conversation didn’t end there. They talked about VanDeWiel’s financial dreams for the future. VanDeWiel shared that she hoped to buy a house for her family of four. Mescher said Dupaco could help. VanDeWiel felt like she was getting nowhere paying down some high-interest credit card debt. Mescher recommended moving the balance to an existing personal loan at Dupaco. That cut VanDeWiel’s interest payments in half, freeing up money to open three new savings accounts—a You Name It Savings Account for a house and a savings account for each of her daughters. With every paycheck, VanDeWiel is now systematically saving for her family. “I already know my daughters’ futures are looking better than they were a month ago,” she says. Now that she is intentionally saving for a down payment, VanDeWiel hopes to buy a house this year. But she has no plans to move away from her longtime credit union, which has continued to help her from miles away. “It will be a huge relief to have something that we can call our own to raise our family in,” VanDeWiel says.